After the death of former President George H.W. Bush on Nov. 30, North Country residents and local leaders are remembering his major environmental legacy, as well as his sincerity, amiable personality and penchant for writing letters displaying both those qualities. In the North Country, Bush was remembered for saving the Adirondacks from acid rain and ozone depletion through the amended Clean Air Act. Lake George Waterkeeper Chris Navitsky said an earlier Clean Air Act hadn’t made much of a difference in the Adirondacks, which are particularly vulnerable to acid rain because there is so much precipitation and impermeable bedrock. The amended act that Bush pushed for was far stricter, and that had the effect this region needed. Locally, acidified lakes have become much cleaner, and Lake George is far better off than it would have been without the increased protection. Data collection on Lake George has shown an improvement in water quality as acid rain diminished. Data released this year found that many acidified lakes in the Adirondacks have recovered to the point where they are habitats to waterfowl and fish again. The amended law also helped the ozone layer recover, phasing out ozone-depleting substances. This year, researchers announced the hole in the ozone is starting to close. 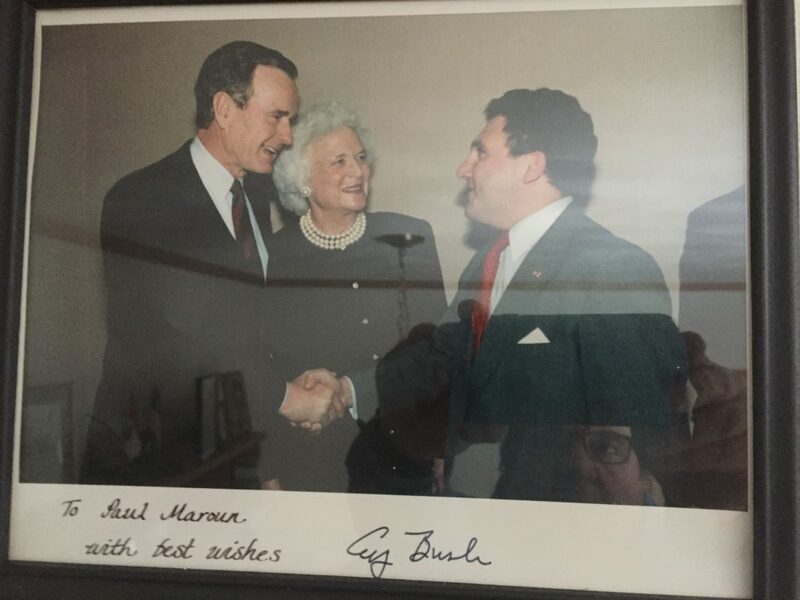 Tupper Lake village Mayor Paul Maroun said he saw Bush’s character qualities firsthand and even has a framed letter from the man from when he was the vice president. Maroun worked in Washington, D.C., from 1985 to 1989 as the senior executive assistant to the administrator of the St. Lawrence Seaway and got to speak with the vice president briefly, six or seven times. Maroun remembers meeting Bush again at a ball in early 1989, right around when he had been inaugurated as president. He shook his hand and talked with the man for a minute, and then, as Bush walked away, added a greeting from his boss. Bush also sent greetings to Jim’s wife, Jill Emery, who had recently run for Congress and been appointed director of the Women’s Bureau of the U.S. Department of Labor. Bush was also a man of the people, said Queensbury resident Freda Solomon, the widow of former U.S. Rep. Gerald Solomon. She and her husband were once invited to the White House private quarters for dinner. “He took us on a complete tour of the private quarters, through all the rooms, including their bedroom and bathroom, which had wet towels everyplace,” Solomon recalled with a laugh. Bush’s wife Barbara “threw up her hands” when her husband insisted that they see the bathroom. “But he said, ‘This is the people’s house, and I want you to see it,'” Solomon said. She remembered Bush as a trustworthy gentleman who worked with everyone to find solutions to the nation’s biggest problems. U.S. Sen. Charles Schumer, D-N.Y., also cited Bush’s ethics. Likewise, U.S. Rep Elise Stefanik, R-Wilsboro, called Bush the embodiment of the Greatest Generation.